They are balanced, swiveling up to 270 degrees, and retractables in an ellipse well for beaching. The bottom of the rudders are in low density foam, to reduce the damages when scraping the bottom with them. 2 elliptical pieces are on the rudder locks, to guide the movement of the rudders in their wells. The upper piece stay fixed on the bridge, and maintain the rudder lock which moves vertically. The lower piece travels with the rudder during its movement, and places itself automatically at the bottom of the main hull. On each pieces, 2 rings are necessary, to allow the rotation of the rudder. The first one, in polyamide, takes the shape of the rudder stock. The second one, in stainless steel, surround the first one, so as to have stainless steel rotating upon polyamide. The wells are elliptical, with a area for the passage of the rings. A small hoist is necessary, and goes through the upper elliptical piece, goes down to the lower elliptical piece, so as to hoist the rudder. - Internal system, protected from vawes and schocks. - It can be dismantled from the bridge, without going in the water. appears above the bridge, up to 1.10 meters high. They are shrouded by a diamond, like a mast, to limit their slackness (just like masts). The lower shroud (diameter 12 millimeters) limit the load when the float is in the water, while the upper shroud (diameter 8 millimeters) limit the load when the float is outside water. A welded tubular assembly, in galvanized steel, with electrostatic paint, links the beams to the float. Some axles in stainless stell (diameter 27 millimeters), alvaged from a scrap metal yard (old industrial washing machines with polyamide rings), llow a rotation of the float from front towards the back. Indeed, when the float's stem hits a vawe, the float can go back 2 or 3 centimeters (about one inch) on a longitudinal axle. This play is limited by sling knots tied on turnbukle. Advantages: flexibility of the whole, limit the torsion of the beams in a big waves' sea. The cross-section of the float is V-shaped, to prevent loading the beams when the float falls down brutaly onto the water (it goes down into the water much more than a flat bottomed float). This modfifies little the performances of the proa, because the float is counter-balanced. The drag is slightly increased. so limit the water intake). Tillers must be dismantled when tacking, because they are 1.90 meters long (slightly more than 6 feet long), and would touch the masts during the rotation. A very short tiller serves for quick tacking, in cramped areas. Transmission is done by rope on pie slices, easily accessible and repairable in case of trouble. The inflatable, with a 25 HP outboard, is used to propel the proa during docking manoeuvring.It is connected to the back side of the main hull when pushing. 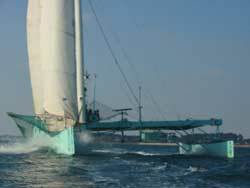 A pad eye on the planking, upwind to the main hull, blocks the inflatable front, while the back of the inflatable is tied on the main sail rail, with the rope going back to a cleat. Under way, the inflatable goes up under the net, under the wind, by a system of clutch jammer cam-cleats positioned near winches. Aboard "Des Jours Meilleurs", most of the fittings are in unidirectional glass-fiber, epoxied. They are lighter and as strong as stainless steel fittings. It is a single unit housing a speedometer, a sounder, an anemometer. It pivots 180 degrees, when shunting, so as to be visible from the other rudder seat. Very useful for navigating with one's family, because anchoring operations are tricky, physically hard, and dangerous because of the size and drag of the proa, multiplied by the surface area of the masts. Once the anchor has set, 2 crow's-feet are used to stabilise the proa, with a harder pull than the one of the main hull, to compensate for the assymetry of the boat. part of the mast, its stratification coming back, spreading, under the floor of the wing. in accordance with the concept of the Pacific Proa. This system works perfectly. 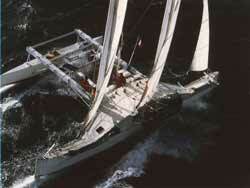 I never had any problem reefing the sails. The halyards are external to the masts. To reef, you just release the tension at the luff, you pull the halyard towards the bottom, then you move it to windward (unhooking it), and the main sail goes down immediately. with the 2 main sails. Performance wise, we pushed her at more than 26 knots, with a wind around 22 knots. Cruising averages are often 10 knots. We, four adults, lived during 3 months aboard. For week-end navigations, it is possible to accomodate 8 people. The wardroom is removable, and can transform itself easily in bunks. The proa is unsinkable, and approved in (French) first category to sail.